home or at a venue of your choice. our popular children's party packages. as a pdf file here. We include a tea if required - here is a link to our standard tea menu. For details of personalised parties for adults, including hen parties and birthday parties, please contact us by email or phone or pop in for a chat. What does a children's party involve? skills and techniques. The party will be in two sessions with a short break for a drink and homemade cookie in between. 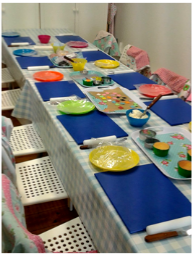 Our parties usually involve decorating cakes as more can be achieved in a shorter time, but we can include baking skills in our longer workshops and for older children. What will the children take home? The children will take home their beautifully decorated cakes and/or cookies which we will gift wrap for them. 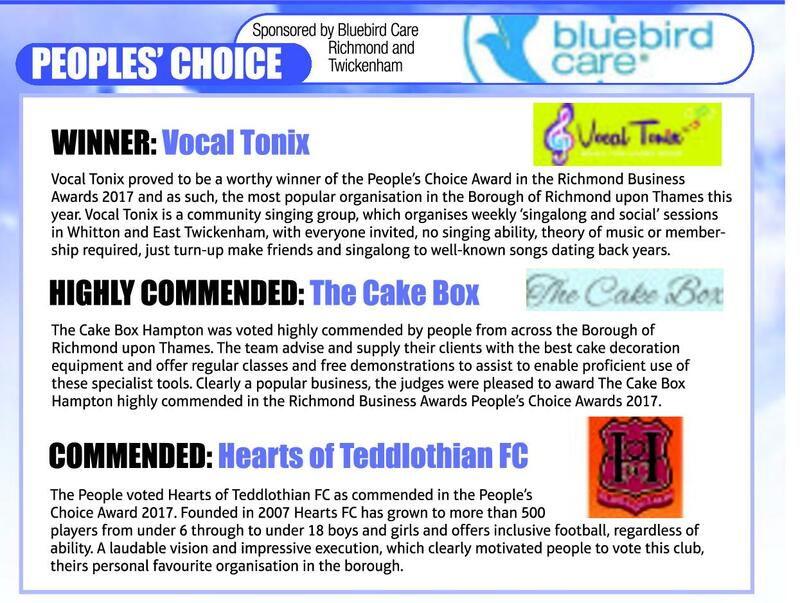 They will also be given a Cake Box certificate. NB: The difference in price covers packing, unpacking, travel time and petrol and an initial visit to your home to talk through space etc. Tuition, refreshments, gift wrapped items children make, Cake Box certificate and tea and cakes for up to 4 attending adults. Plus optional handout pack for older children. How many children can you cater for? The price is per head is based on a min of 6 children. Less can come but you would have to pay for 6. Within our opening hours of Mon-Friday 9.30 -5.30 pm including school holidays we can take up to 12 children. After 5.30 pm or on Sundays we can take up to 15 children. We can also run parties in your own home or in a venue of your choice, where numbers can be more flexible. Do you offer a party tea? A party tea can be provided at a cost of £4-£6 a head depending on age and appetite of children! Tea includes mixed sandwiches, plus fresh fruit and salad, crisps, small cake or biscuit and soft drinks. For older children we can provide Pizza, garlic bread and salad, followed by ice cream and fresh fruit. You may also bring your own tea/food boxes at a cover charge of 50p-£2.00 per head following discussion. Click here for our standard menus. What about a birthday cake? Well, of course we are the right people to ask! We can create you a cake at a special party rate. You can bring your own cake if you wish, for a charge of £3 to cover cutting and wrapping for you. What party themes do you have? Here are some ideas for you to choose from. Some of these ideas are best suited to cupcakes, some to cookies and some to both. If you want something slightly different we are happy to discuss your ideas. Teddy bears - Jungle animals - Cars and boats - Underwater world - Ballet - Mini-beasts - Dogs and cats - Robots - Snowy Princesses - Flowers and butterflies - Owls - Hedgehogs. 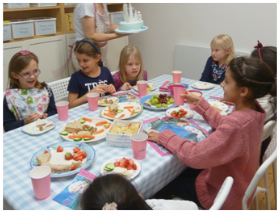 Our children's parties are very popular and weekend dates in particular get booked up in advance. If you are interested in booking a party it is sensible to pencil in your date as early as possible. To confirm and secure the booking we ask for a 50% deposit and will fill out a party planner sheet with you. This can be done in person or online. 50% Deposit to confirm booking, balance on the day of party. We are happy for source items such as balloons, flowers, party bags and other services to make your party even more special. 1 week's notice or more - numbers can go down to minimum of 6 but as stated above you will still be charged for 6. 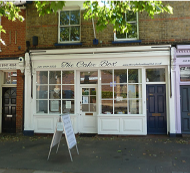 Less than 1 week's notice - a credit note for the difference will be given to use for anything from The Cake Box within the next 2 months. If, due to unforeseen circumstances we have to cancel, a full refund will be given to you. Joanna is a trained early year's teacher and has a paediatric first aid certificate and an enhanced DBS clearance. We ensure that the staff levels match the age and needs of the children. For parties for 5-6 yr olds we ask that a familiar adult stay on the premises at all times. We suggest that toilet trips are supervised by you/another parent. We ask for a list of children's names and any special needs or allergies and would ask that you have contact details of all parents with you. We have a child gate on the kitchen doorway. Kelly said: A HUGE thank you for the party this morning. As you know the birthday girl thoroughly enjoyed herself and was a keen teacher! All the parents have texted to say how impressed they were with the children's efforts and I know the children had a great time. Thank you as always for your time, patience and most importantly expertise! I would not hesitate to recommend the parties to anyone. Chris said: Thank you so very much for making Dora's birthday as fantastic and as happy as it was. She was so happy and it was all exactly as she wanted it! The cake was perfect - everyone who tasted the cake complimented it and everyone who collected their children spoke highly of your business. 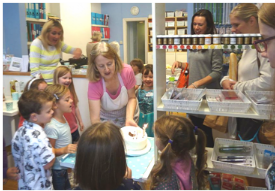 Trudy said: My daughter has just had her 5th birthday party at The Cake Box, and I can honestly say it's been a delight from start to finish. Jo is brilliant with the kids, so if you want a hassle-free chilled party idea, I can't recommend Jo at The Cake Box highly enough. 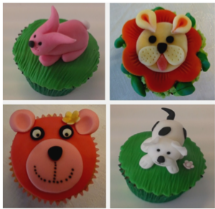 Meet up with your friends at the shop or in your own home for an evening of fun decorating cupcakes or cookies. Bring your own drinks.